BELLY FLOPS. NEW 454g Bag! 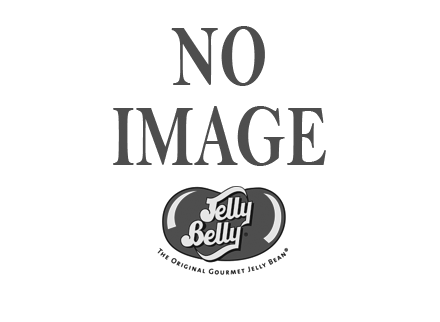 Here at Jelly Belly, we believe that every single jelly bean is special. No matter if it’s shaped a little weird or missed its date with the Jelly Belly logo stamper, each and every Jelly Belly jelly bean is beloved in our eyes! Because we’re so passionate about making sure every last bean has a special home (in your stomach preferably), we offer our less-than-perfect jelly beans as Belly Flops. 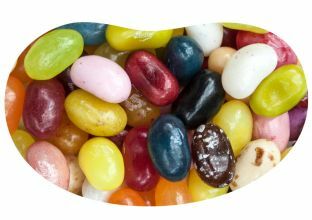 Not always available, these irregular jelly beans are perfect for those candy lovers who are all about the legendary Jelly Belly flavours and don’t mind a little bit of visual imperfection! Jelly Belly Flops are no less lovable or tasty than regular Jelly Belly jelly beans. They’re simply a little bit less perfect! You might get one that’s square, rectangular, stuck to another jelly bean or slightly chipped. 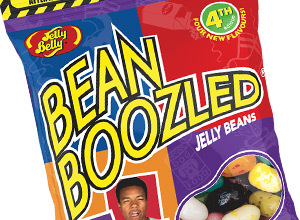 Some of our Flop aficionados have even discovered jelly beans with flavours that don’t match their colours! And, just like all Jelly Belly beans, these 454g bags are perfect for adventurous eaters. classics. You just never know! Oh yeah, and did we mention that they come at half the price?! What's not to love? INGREDIENTS: Sugar, glucose syrup, modified cornstarch, the following ingredients are present in certain beans depending on flavours: acidity regulators (E270, E296, E297, E325, E330, E331, E334), flavourings, blueberry puree, fruit and plant concentrates (spirulina, apple, carrot, blackcurrant, pumpkin, safflower, purple sweet potato, hibiscus, radish, grape), strawberry puree, colours (E100, E150a, E153, E160a, E162, E163ii, E171), glazing agents (E901, E903, E904), raspberry puree, lemon puree, orange puree, banana puree, peach puree concentrate, blackberry puree, grape juice concentrate, apple juice concentrate, cherry juice concentrate, chocolate (sugar, cocoa mass, cocoa butter), pear juice concentrate, passion fruit juice concentrate, lime juice concentrate, mango puree, cocoa powder, lychee juice concentrate, dried coconut powder, kiwi juice concentrate, watermelon juice concentrate, mango juice concentrate, pomegranate juice concentrate, tangerine juice concentrate, pineapple juice concentrate, grapefruit juice concentrate, salt, cantaloupe powder, freeze-dried soluble coffee, thickener (E1400), vanilla beans, ground cinnamon.